Meridian sound system for Evoque | What Car? The Range Rover Evoque will have audio systems developed by British hi-fi specialist Meridian Audio. The systems will match the sound quality of Meridian's high-end home entertainment equipment, Bob Stuart, Meridian founder and chief technical officer, told our sister site whathifi.com. 'We believe that the hi-fi systems used in the next generation of Range Rovers will set new standards in automotive in-car entertainment,' said Stuart. The Evoque will be available with two optional Meridian sound systems: a powerful 380-watt, 13-speaker arrangement, and a top-of-the-range 825-watt, 19-speaker unit with full surround sound. State-of-the-art amplifiers incorporate Meridian's latest digital processing technology to ensure 'perfectly optimised sound quality'. 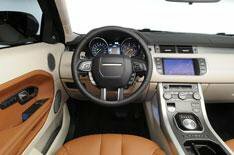 Harman Kardon will continue to supply Land Rover with 1200-watt, 19-speaker surround sound system for the Range Rover and Range Rover Sport models.